Guten Morgen, good morning, bonjour, buongiorno… different words to address a new day and so many different ways to start enjoying it with tasty, healthy, gluten free products. Verival brand is definitely was one my favorite to kick off my day with a natural, organic, gluten free breakfast. At Verival they are specialised in muesli, porridge, cereals, flakes, snacks, waffles, toppings and so much more. I was happy to discover at the supermarket yesterday that some of their products are also gluten free labelled. 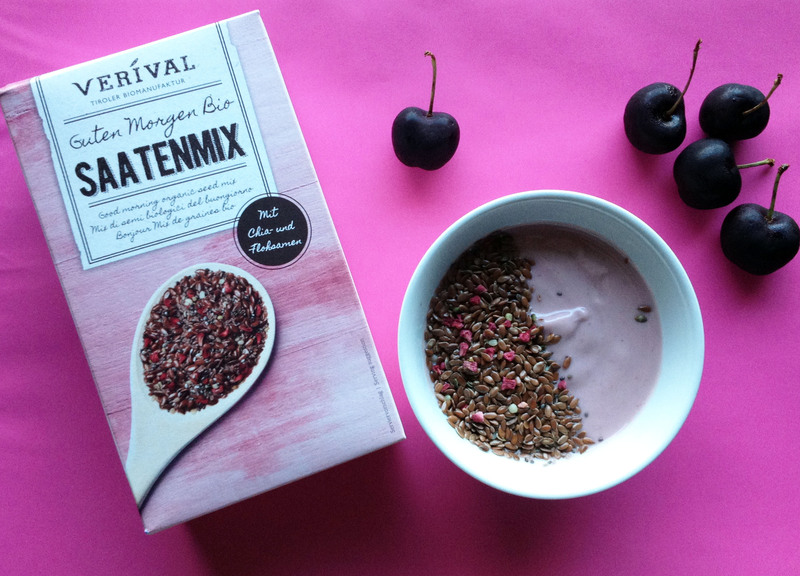 I tried Verival mix with brown linseed, psyllium, chia seeds, hemp seeds, dried raspberries, all certified organic, so crunchy and tasty. I fully enjoyed it this morning with yogurt + black cherries. It was delicious! Breakfast has always been my favorite meal and I can’t wait to discover more about the brand and taste some other gluten free products.